The Airbus A380 is a remarkable aircraft and the world's largest passenger airplane. It can carry up to 853 passengers and is undoubtedly the center of attention at any airport in the world. After flying with the Dreamliner last year, I was really keen to finally endeavour on a trip with the Super Jumbo. To date, Emirates operates the largest A380 fleet in the world with 85 Super Jumbos (correct at November 2016) and more than 60 Airbuses still to join over the next few years. On my flight from Dubai to Singapore I had the opportunity to review Emirates' flagship and I'm super happy to share my experiences with you. 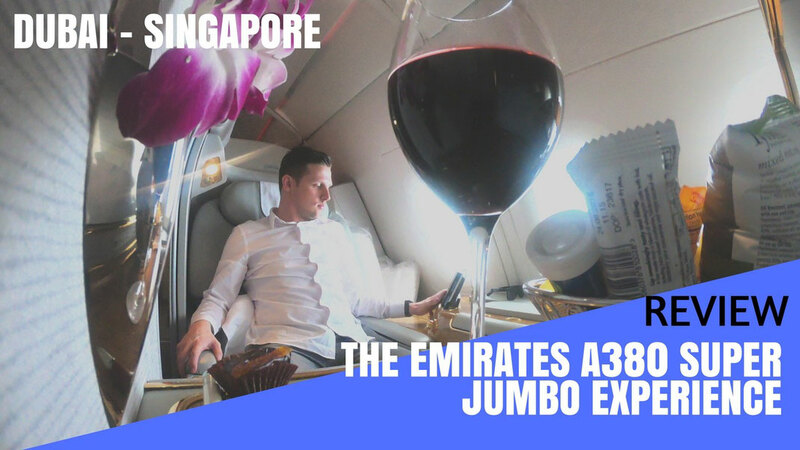 If you don't want to read the review (I know, too many words) you can just lean back and enjoy my video report which gives you a detailed inside of what it's like to travel on Emirates First Class review. Best Seat on the A380: There are shared opinions but check what Seat Guru has to say by clicking here. Best Hotel to stay in Dubai: The Marriott Marquis (tallest in the world) or the Rotana Rose (second tallest). Both quite affordable. What to do in Dubai: I published this Dubai Guide based on a two days layover. I have lived in Dubai myself and I know the coolest spots. At the moment the following airlines operate the Airbus A380: Air France, British Airways, China Southern Airlines, Emirates, Korean Air, Lufthansa, Malaysian Airlines, Qantas, Singapore Airlines, Thai Airways and Qatar Airways. From a technical point of view the Airbus is truly a masterpiece. It's hard to believe that such a big airplane can even take off. It can carry up to 853 passengers with an economy class-only configuration. As a comparison, Boeing's latest version of the 747, the 747-8, can only transport 605 passengers on a full economy class configuration. It means bigger cabins, more leg room and more space for new things, such as showers, spas, private suites, and even a bar! The humidity levels are also increased which makes long haul flights more pleasurable for your airways. The core purpose of this new aircraft is to make air travel more sustainable for both airlines and the environment. It has cheaper operating costs, new engines with less noise pollution and overall provides a better flying experience. The main deck is completely dedicated to the Economy Class. 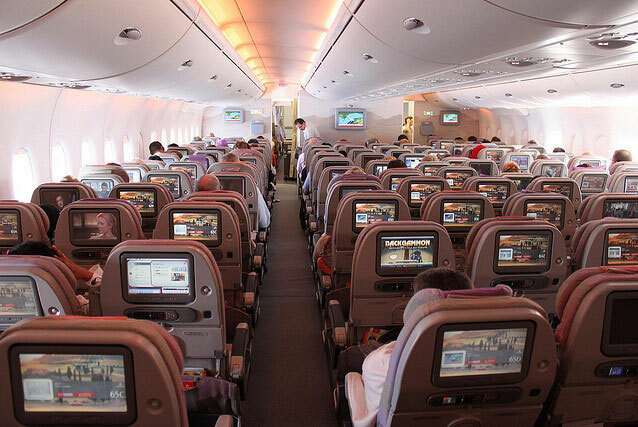 You will find 407 standard seats all equipped with a wide screen, USB charger and a socket in a 3-4-3 configuration. The leg room is the same as on the Boeing 777 or any other Emirates flight. The best feature is probably the supplied Internet access in exchange for a $7.50 fee. The surfing experience is fast and reliable if you stick to simple browsing or checking your Facebook or emails. Business Class is located on the upper deck together with First Class, which you will find more towards the front of the upper deck. All 76 seats convert into a flat bed up to 79 inches just with a simple touch of a button. I personally enjoyed the mini bar and the big working space with a power supply for my laptop while enjoying some good movies on the large screen just in front of you. As a Business Class passenger you also have access to the Emirates Sky Bar. It's a great way to socialise with other travellers or your friends. 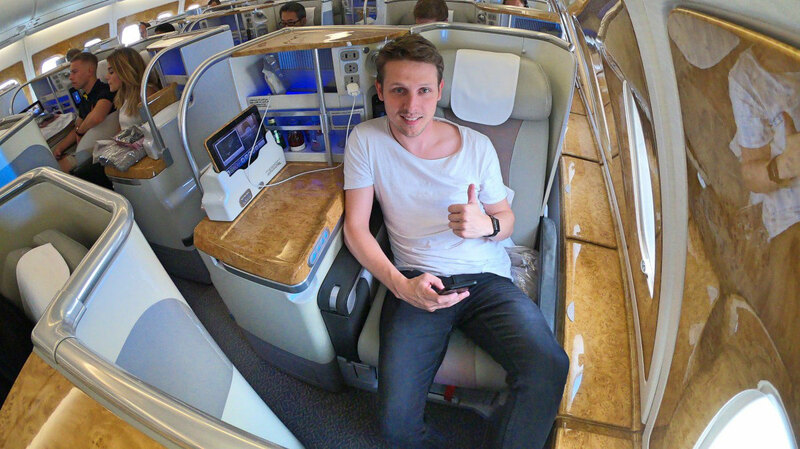 Read my comprehensive review of Emirates Business Class. Even a well experienced first class traveller will be surprised. 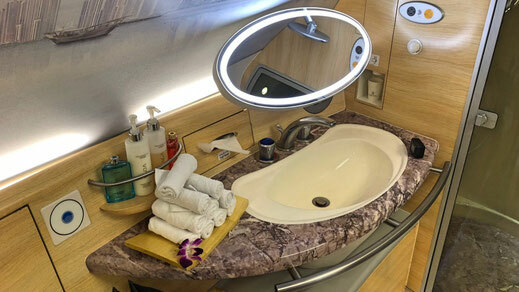 Emirates offers 14 individual suites for its prestigious passengers which also comes with a spa. Yes, you have heard right! You will find a proper hot water shower on board, the perfect refreshment after a 10 hour flight. Your very own suite comes with everything you need. Mini-bar, personal writing kit, refreshments, power-socket, large screen, automatic window blinds and of course complimentary wifi. Coffee, champagne or whatever else takes your pleasure will be served on a regular basis. Lounge and bar access is also included of course. On some special routes, Emirates even offers a chauffered limousine service for pick up and drop off for its First Class passengers. Talk about luxury. If you want to have a more detailed First Class Review on Emirates A380 check out my latest article. Emirates was awarded as the best airline in the world by Skytrax in 2013 for the first time ever. That was a great accomplishment and I personally can only agree with it. I have been on a couple of Emirates flights, including its longest from Los Angeles to Dubai (16hrs) and I've always been very pleased. However, the A380 seems to have a reputation of being very unpopular among airline crew. 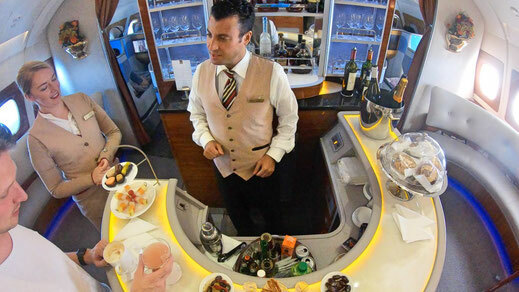 A high number of passengers requires a lot of work and the top service expected from Emirates means that sometimes the staff give off the impression of being overchallenged. I think the service on the regular Boeing 777 is more personalised and dedicated. 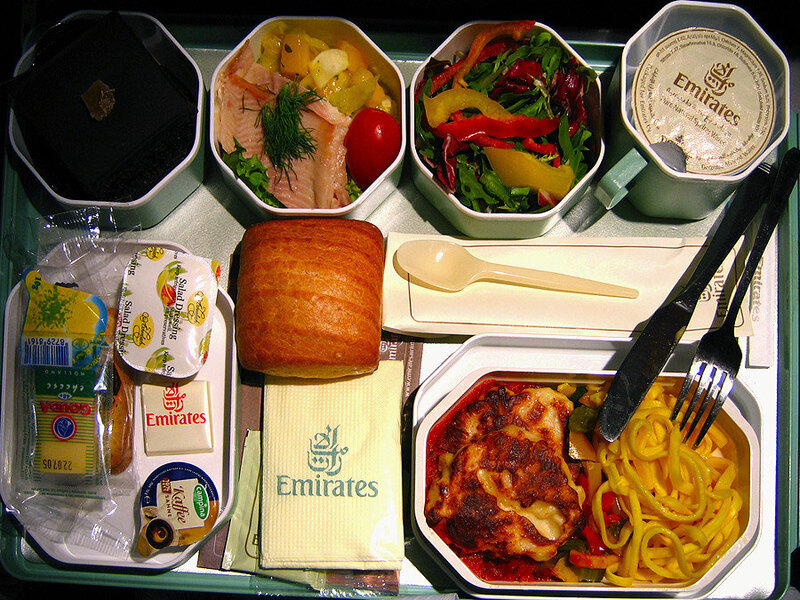 The food on Emirates flights is usually very good and of high quality. You can always choose between several meals. Snacks will also be served and most of the time you will find the cabin crew offering soft drinks and other refreshments. 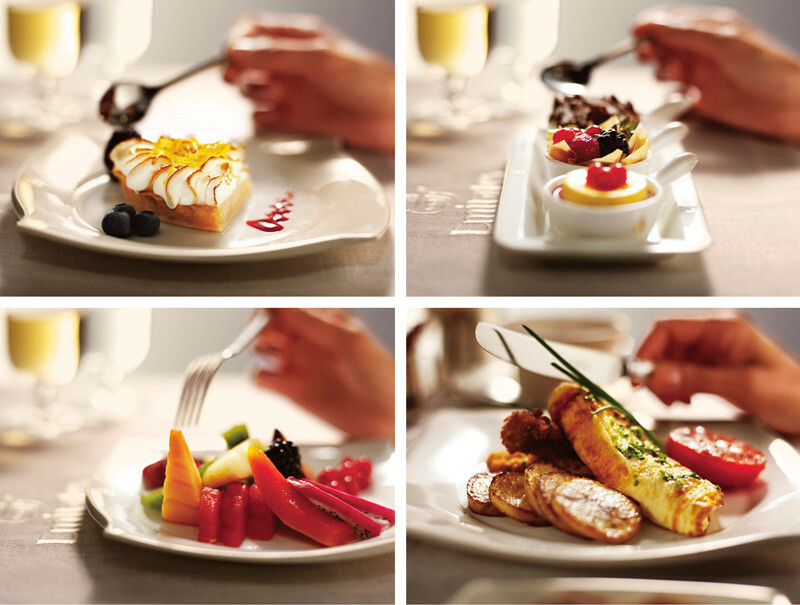 If you have a flight departing in the morning you will also get some breakfast and lunch. If you are travelling Business or First Class, cakes, crisps and sandwiches will be always available near the bar. The ICE entertaining system is by far the best I have ever experienced. Not even Qatar Airways or Qantas get anywhere near it. I find it easy to use, the content is first class and the range of movies, TV series and games is unbeatable. It's easy to use and the responsiveness of the screen is almost as perfect as an iPad. It does make a major difference especially on a 16 hour flight. I mostly fly with Emirates because of the awesome entertainment they offer to their passengers regardless of class. Watch my Review of Emirates A380 - must watch! 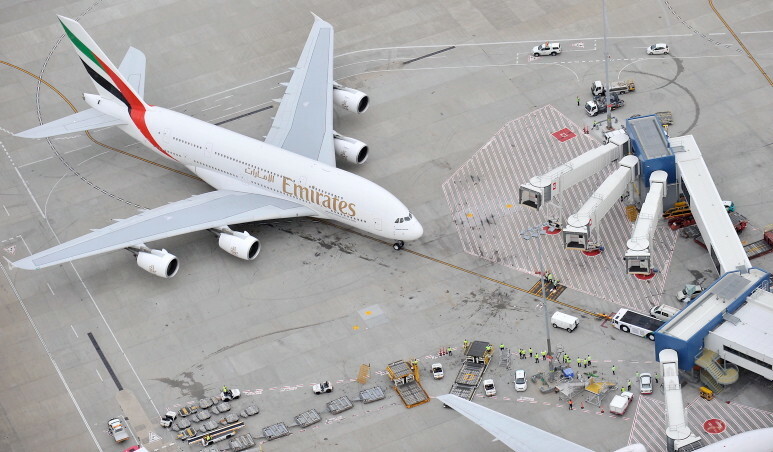 On which routes does the Emirates A380 operate? 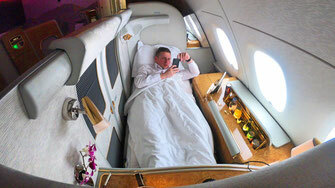 Emirates normally just operates to and from Dubai but there are a few exceptions. On its Australian routes to Melbourne, Brisbane and Sydney the A380 then continues on to Auckland in New Zealand and back to Australia, and from there the Super Jumbo heads back to Dubai. That doesn't apply to Perth and Adelaide though because they are only served by a Boeing 777 and fly back to the Middle East without stopping in New Zealand. Both London airports Gatwick and Heathrow, Munich, Moscow Domodedovo, Frankfurt/Main, Paris Charles de Gaulle, Manchester, Rome Fiumicino, Amsterdam, Zürich and Barcelona. Toronto Pearson, New York City JFK and Los Angeles. Bangkok Suvarnabhumi, Seoul Incheon, Kuala Lumpur, Jeddah, Hong Kong, Singapore Changi, Bejing and Shanghai. To Mauritius Sir Seewoosagur Ramgoolam International Airport only. Brisbane, Sydney, Melbourne and Auckland. The Airbus is definitely a game changer and I loved travelling on the Emirates A380 and I can strongly recommend it to anyone. The entertainment system, the great service and especially the increased humidity are all big pluses in comparison to older aircraft. I wish that the A380 could have bigger windows like the Dreamliner and maybe a bar for Economy class travellers could also be a big asset. Emirates isn't the best airline in the world for no reason. Regardless of which Emirates flight you are on, whether it is a Boeing 777 or an Airbus 380, the service and the entertainment is going to be almost identical. That's what I love about Emirates, you definitely know what you're in for. Flights with this airline from the Middle East are also usually cheaper than their competitors and probably the cheapest A380 flights available on the market. You can't go wrong with this airline! Get the latest deals into your inbox!